It's 180,000 carats and weighs 840 pounds. Its value is estimated somewhere in the $370 million range, but really, the Bahia Emerald is so rare it's virtually priceless. No wonder the raw gem, which was found in 2001, is such a hot property — and has been at the center of a legal saga that's lasted years. According to a decision handed down today in Los Angeles, the legal battle over the massive emerald with a strange history (it even survived Hurricane Katrina) will continue between the Americans fighting over it, despite recently-expressed interest from Brazil, the stone's country of origin. The emerald was first discovered in Brazil's Bahia mines in 2001. It was reportedly shipped from São Paulo to northern California, then bought, sold and allegedly stolen several times in several locations. Then in 2008, a man named Larry Biegler reported it stolen from his California warehouse. Police found the emerald in Las Vegas in the possession of Kit Morrison, who said he bought it from Biegler. Morrison said he paid seven figures for the emerald and has proof. "We have a purchase and sale agreement we have a lot of documentation," he said. But the stone's story isn't that crystal clear. "It belongs to Brazil and we are going to fight for it," Brazilian government representative Marconi Melo said. 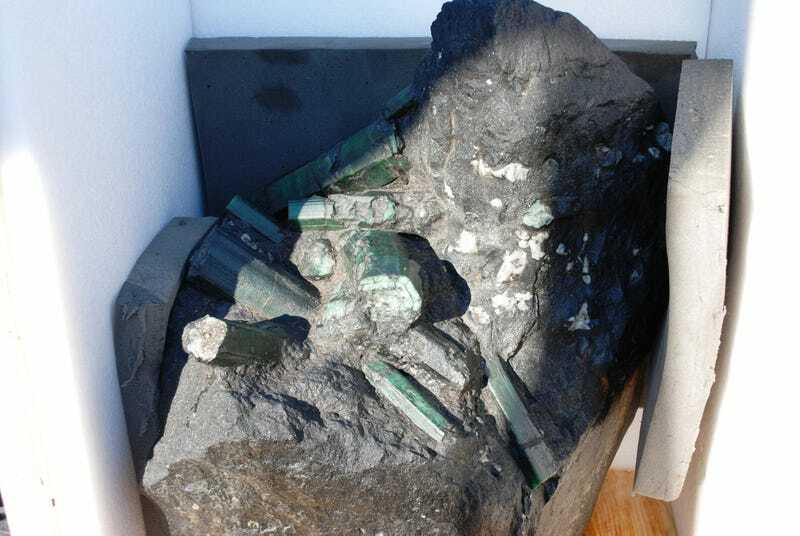 The government claims in court documents that the emerald was "illegally mined, illegally transported, illegally exported to the United States." When asked if they would even care if the emerald weren't worth so much money, Melo said, "We care that no gem or stone or mineral of Brazil could be taken out of the country without the correct authorization." The Bahia Emerald's ownership has been under debate since at least 2008, thanks to a tussle between the then-owner, the third-party company he'd hired to sell it, and the potential buyer. At the time, CNN reported that "someone used falsified papers to remove the stone from the secured vault in California" where it was stored, and spirited it to Las Vegas, where it was eventually discovered. As the Sydney Morning Herald reports, the Brazilian government — which believes, Indiana Jones-style, that the emerald belongs in a museum — entered the debate last fall, though the judge in the case determined the ongoing case would proceed apace; another ownership claim was dismissed in January. The Brazilian government last year asked a judge to dismiss the case outright or put it on hold while Brazilian officials continue negotiations with the US government to secure the stone's return ... Judge Michael Johnson made clear Monday that he was not ruling on the merits of Brazil's claim to ownership, but instead solely on the motion to dismiss or pause current court proceedings in Los Angeles. Brazil's motion lacked sufficient evidence to warrant halting the case, Johnson said. There was no official declaration from Brazilian officials, nor was there any indication that diplomatic efforts would prove fruitful or timely.